April is Earth Month at NC State. This month-long emphasis on the planet, sustainability and how you can make the world a better place is hosted by NC State’s Sustainability Council and University Sustainability Office and sponsored by NC State Campus Enterprises. Earth Month is a month-long series of programs that educate the campus community about sustainability. 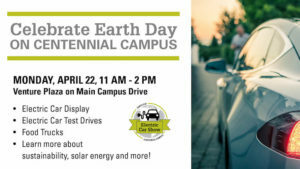 Celebrate Earth Day with an electric car display, electric car test drives, food trucks and more.